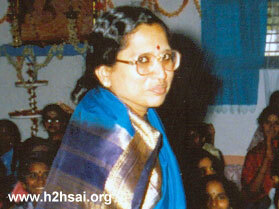 Dr. J. Hemalatha has had an illustrious career, serving the Anantapur campus for 31 years. After obtaining her M.A., and Ph.D. degrees in Telugu Literature from Osmania University, Hyderabad, she worked in the erstwhile Sri Sathya Sai Arts and Science College for Women, Anantapur, almost from its inception in 1968. 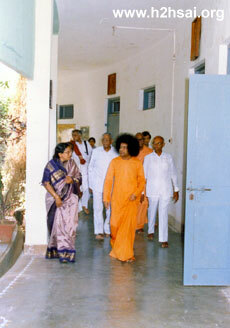 She retired as Professor of Telugu and Principal of the Sri Sathya Sai University, Anantapur Campus in 1999. She served as a Member of the Boards of Studies of several Universities in India. A litterateur, she has classified and compiled the poems Bhagavan sings in the beginning of His Divine Discourses in a Volume, entitled “Subhodha.” She has also translated five books on Swami from English to Telugu. Her latest book “Women’s Role in Rejuvenating the Culture of Bharat” is a compilation of divine discourses delivered by Bhagavan Baba exclusively to His women students and staff at Anantapur over a twenty year period, from July 1968 to August 1982. 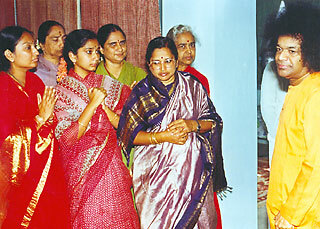 Dr. J. Hemalatha was the recipient of the Best Teacher’s Award from the Government of Andhra Pradesh in 1979. Above all, she comes from a traditional Brahmin family and has deep roots in Indian Culture and Tradition. She has won the appreciation of audience everywhere when she gave talks on learned and religious subjects. She currently resides in Chicago, USA where, along with her husband, Dr. B. Srinivas she promotes Sai teachings, especially service activities and the learning of the Vedas among spiritual aspirants. Reproduced below are select extracts of her conversation with Dr. Rajeshwari Patel, Department of English, Anantapur Campus of the Sathya Sai University who had interviewed her in the Radio Sai studio in 2006. In this conversation, Dr. Hemalatha talks about her journey to Sai and how the Supreme Teacher Bhagavan Baba groomed her to be an instrument in His Mission. She fondly recalls the nurturing and attention that Bhagavan Baba showered upon the Anantapur campus during its nascent days, preparing it for the role it was to play as the Lead College of a future university. The account includes gripping experiences as well as the detailed instructions, guidance and comforting words that she received from Bhagavan during her tenure. When the going got tough for Principal Hemalatha, the doses of divine dispensation came either in the form of personal counsel or as letters from Him. We hope these revelations will offer you greater clarity on Bhagavan Baba’s perspective on women’s education and their important role in society. 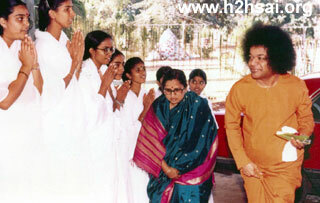 Prof. Hemalatha: Sai Ram. I was drawn towards Bhagavan as I saw in Him the Best Universal Teacher. Unlike many people, I did not come to His fold as a devotee first. Neither was I attracted merely by His miracles. It was way back in June/July of 1968. I was staying at Rajendra Nagar, 10 kilometres from Hyderabad. One morning, I happened to go to my parents’ place at Himayat Nagar in the same city. My parents, Dr J.V.R. Sarma and Srimati Rukmini Sarma, were about to go somewhere. My mother, who was happy on seeing me, asked me to accompany them as they were going to have darshan of Bhagavan Sri Sathya Sai Baba. I was absolutely unaware of who He is. My mother said that one of my father’s friends, Dr. Bapi Raju is taking them to Bhagavan as they were also new at that time. Bhagavan happened to be visiting the city of Hyderabad at that time on His way back from Bombay (now Mumbai), soon after the inauguration of His centre there known as Dharmakshetra. Hence my parents were keen to avail of the opportunity. I was reluctant and refused to go - of course to my misfortune, as I later realized! 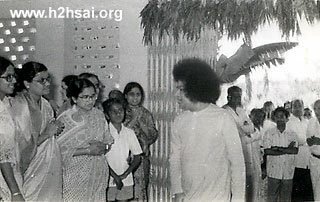 Subsequently, my mother told me that Bhagavan graced my parents with an interview that day. I had missed the opportunity! This was the first instance of my hearing about Bhagavan. But as I said, to my ill-luck, I did not pay much cognizance to it and forgot about it temporarily. Soon, in the first week of August 1968, my husband, Dr B. Srinivas happened to leave for Gujarat on some deputation for his higher studies. And during that month, in a mysterious way, my coming to Bhagavan’s fold finally happened. Just a few days later, on the evening of August 12, 1968, my father and I happened to visit my Professor, Late Diwakar Venkatavadhani garu, who was an ardent devotee of Bhagavan Baba. I told my Professor whom I treated as my father, about my husband’s going to Gujarat for two years. Immediately, he said “I think Swami is working it out in His own way.” I was perplexed. Then, he said something and this statement of my Professor, I can never forget. He said, “I am sure you would like Bhagavan and Bhagavan likes you. As I know you personally, I am confident that I will be sending a suitable candidate for His college. Let me tell you, even after hearing all this, maybe due to the fear of going and starting over in an unknown place with two little children and an aged, sick mother-in-law, I hesitated to agree. My father intervened. He advised me not to refuse. I explained the situation to my mother-in-law and there too Swami’s will prompted her to agree to this at the last minute. I am sure it was the same divine will that made the head of the institution where I was working at that time in Hyderabad, understand my circumstances and accept my resignation, even though with a heavy heart. I could not even inform my husband at Gujarat. All the telephone lines were disrupted due to heavy floods at that time. It happened just like that, against all these odds, and I happened to go and receive the appointment order, the very next day, that was August 13, from the then Honorary Secretary and Correspondent of the College, who was at Hyderabad. It is quite unique that after receiving the appointment order, I submitted the formal application, just to conform to the procedure! I was asked to join at least by August 18, in just 4-5 days. I arrived at Anantapur on 18th morning and reported myself to duty immediately. There, I saw for the flirst time, a full length picture of Bhagavan. This kindled an inquisitive feeling to know more about Him. Of course, the college officially started to work from July 22. But the admissions were still going on. And I started my teaching from August 18 onwards. Interviewer: When did you have Bhagavan’s darshan for the first time? 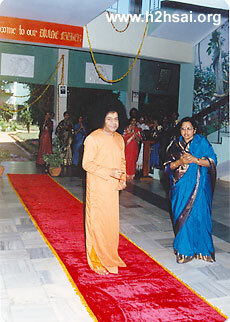 Prof. Hemalatha: After a week or 10 days of my joining the college, Swami came to the College. It was really a miraculous thing that happened. 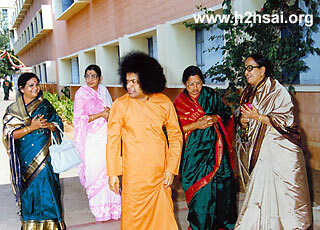 Swami’s car entered the campus. At that time, the College was situated in temporary buildings, in the campus of the Government High School in Anantapur Town. Swami’s car stopped just before the classroom where I was teaching. I was standing in the classroom. Swami’s car stopped and He was in the car. I saw Swami for the first time through the window. Sitting in the car itself, Swami blessed me and moved on to go to the Principal’s Office. This is a very sacred day to me; I had the first darshan of Swami. The same day in the evening, I had the fortune of listening to His Divine Discourse. That incident left the first reverential imprint on my heart. It is very special to me. “Such education which does not touch the soft corners of our minds, and which does not purify our hearts cannot be called as education. Education should make people to be courteous and tolerant. Otherwise, it is only gathering some information to get some degrees and earn some living. Even beggars can earn to feed their stomach. Just for that, we need not study so much”. Though I was absolutely new, I did not appreciate that adverse criticism. I thought “Why do these people talk like this? Can’t they wait for ten minutes for the arrival of the Founder President of the College they are working in?” While these thoughts were going on inside me, Swami arrived. As He was walking in, He went on explaining the reasons for the delay. I was absolutely moved with this incident! What a great lesson? Being the Highest Authority of the College, by the time of the evening, He need not have given an explanation. By that time the concept of His Divinity was not there in me (it wasn’t so deep); I regarded Him as the Founder President, that’s all! But I thought there is absolutely no reason for His explanations for the delay. Don’t we see many so called leaders arriving for meetings late by hours together? Do they have any concern for the people waiting for them? With these thoughts, I learnt my first lesson at the Lotus Feet. I realized that true greatness lies in humility! From that moment Swami taught me innumerable lessons both directly and indirectly. I did not understand the head or tail of this divine statement. I just kept quiet. After nearly one year, I came to know the secret of this remark. By the time, that was July 1969, I was holding the additional charge of the post of the Principal. The selections for some vacancies were being held in July 1969. One of the applicants for the post of an Assistant Lecturer in Telugu happened to be my classmate in M.A. at Osmania University. After the interviews were over, she told me that she appeared for an interview for the post in 1968 and waited for the result for a long time. She didn’t get it, for obvious reasons! Swami’s miracle worked it out. As she did not hear from the college, thinking that she was not selected, she joined some other college at Vijayawada signing a bond for serving at least for a year. Just a few minutes after she signed, she received an appointment order from the Management of Bhagavan’s College. 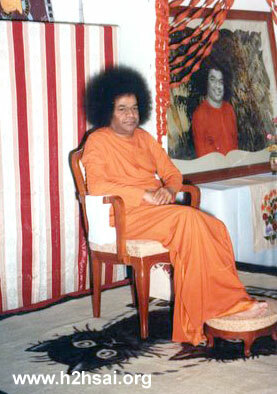 The postal department obeyed the command of the unseen hand of Swami; it took more than 20 days for a letter to reach from Anantapur to Vijayawada, both of which are in the same state. This is how Swami says ‘Yes’ or ‘No’, as per His will. Swami made me understand the mysterious way He works and realize how insignificant we are, before His divinity. This is how I have come to His fold as I said, in a very mysterious manner. Interviewer: This is how Swami works! Madam, you were saying that when you came to Swami, you came with a fresh mind. You had no preconceived notions of Swami. What is it that really drew you to Swami? What attracted you to Him? Prof. Hemalatha: It was not the miracles! I joined the college and I was carrying out my duties. And I told you the first incident that happened. Gradually I was developing an interest to know more about Bhagavan. Woman is the foundation for the society and her heart is the source for virtues. Events also took place accordingly. In September 1968, the Principal asked me to talk for one hour. You can imagine how much one has to read to speak for an hour. 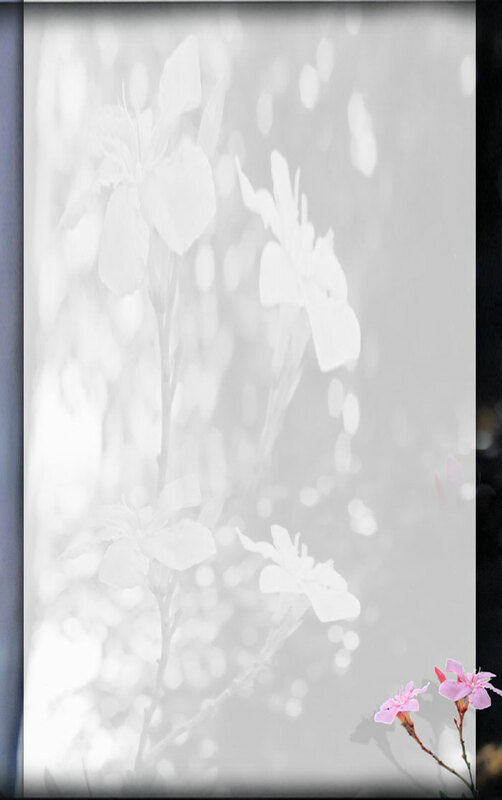 I came to the college like a clean slate. I therefore requested the Principal to give me some reading material so that I can prepare for the talk. 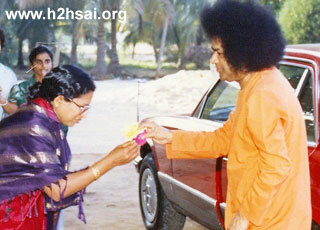 She gave me “Sathyam Shivam Sundaram” and “Sathya Sai Speaks”. At that time there were only five volumes of “Sathya Sai Speaks” published; somehow these volumes attracted me. That is why I wanted to know more about what Swami said, what He teaches. It is not really an exaggeration; really I could not sleep until I finished all the five volumes. I read them continuously staying up two to three nights, while during the day I was working in the college. I was so drawn to those volumes. Shortly after that, Mothers’ Day was celebrated in the College. Swami named it that way. Mothers’ Day, in lieu of Parents Day, as usually celebrated elsewhere. We were all excited to see Swami; He came along with a few guests. Interviewer: Mothers’ Day, when was it celebrated? 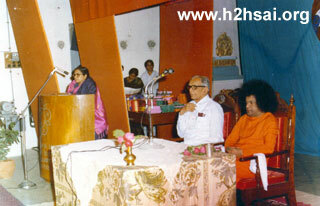 Prof. Hemalatha: It was in October 1968, Swami fixed one day to celebrate this event. At that time, it was not very formal. 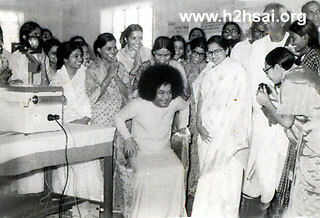 Swami used to come in a very informal way to the college. There were hardly 120 students and 8 staff members. 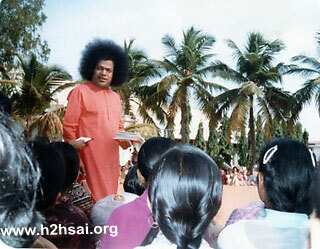 As soon as Swami got down from the car, seeing me, He commanded that I should speak on that day’s meeting. It was going to begin immediately. It was absolutely unexpected for me. I felt very nervous. Soon after the welcome address by the Principal, I was asked to speak. By that time, though I was very much attracted by the discourses I read, the Divinity aspect of Swami did not still blossom in my heart. And so, I could not address Swami as Bhagavan, nor could I say 'Pranams at the Lotus Feet', as I do today. I very well remember that I addressed Him saying, “I offer my respects and regards to Sri Sathya Sai Baba Garu, who is the embodiment of the entire Bharathiya (Indian) wisdom”. I said just this in Telugu. Why I am telling this is later some people told me that I should not have addressed Swami like how I did. But I was happy for Swami’s appreciation. Interviewer: Swami liked the honesty, instead of putting on a kind of show as if you are devoted. You said what you said. Prof. Hemalatha: Yes, because He is the One who knows our heart. Interviewer: Please tell us some of your early experiences in the College. Prof. Hemalatha: During the initial years, that is from 1968 to maybe 1974, so many incidents happened which transformed my personality. 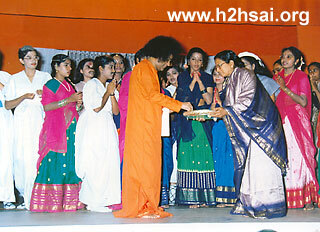 I can never forget those wonderful moments I had with Swami during those early years. It was April 1969, just 8 months after my joining the college. It was summer vacation. One afternoon, the college peon comes to my house with a letter, which says that I have to take additional charge as Principal. April 1969, just after 8 months of my joining, all of a sudden, I received this letter. I was really shocked. I decided that I cannot undertake such a big responsibility. I was hardly 28 years old at that time. And so immediately I went to a local telephone booth; we didn’t have a telephone at my house in those days. And I told that senior gentleman, who signed that letter and sent it, that I hesitate to obey his orders. He told me that “Ma, it was under Swami’s command I have sent that letter.” He also said that when Swami wills, He makes His selected instruments carry out the tasks He wants to be fulfilled. That means He makes us His instruments and He sees that His work is done. I realized there was no other option left for me. I only prayed to Him, that I do not fail in putting in my best efforts and in rising up to His expectations. Of course, by that time, I was blessed with a strong conviction about Bhagavan’s divinity. Interviewer: How is it that you began to believe in Bhagavan’s Divinity? Prof. Hemalatha: As I said, His teachings attracted me. Moreover, a few incidents happened in my personal life too. My husband and children - when they were stuck in a cyclone and a train accident, in March 1969, they were saved miraculously by Swami. I don’t want to go into the details. When I started narrating or just telling about this to Swami, He Himself told me in detail what happened. Interestingly, I never touched His feet till July 1969. That was the first time when I had all my conviction that He is God, I prayed to Him, Swami, “Can I do Namaskar (salutations)?” Swami said, “Do Bangaru (Golden One), if not for you, whom else?” Many incidents took place later. This is how I definitely believed that He is Divine. Interviewer: Madam, you joined the college in 1968. Therefore what better person can we have than you, to give us a brief history of the College? Please share with us what you think was Bhagavan’s Vision when He started these educational Institutions? Did Swami talk about His vision to you at any time? Prof. Hemalatha: Swami gives a lot of importance to education as all of us know. What is the type of education He wants? It is not for adding one more institution to the existing ones. But it is to train and mould the youth in the right path that Bhagavan has established this education. In this context, Swami wrote a few letters to me. In this letters He mentions what type of education He wants. Here are the excerpts of a few letters. Atti gnana deepikaluneni vidhya agnananthakaramtho pogamevaluvu undanu. There is a saying in Telugu, “A washerman is better than an educated man.” Education without general knowledge and common sense is mere bookish knowledge and is a sheer waste! “Chittamunu metha parichani hrdayamuni chutti para manasunu madhuramuka cheyyalani paniyilo chad pottakodi chaduvulu. Bikshakani pottakai intha chadhuvulu chadhuvuna? Chaduvarulalu chillara bhavam unduta Saraswathike agowrame. He says it is a disrespect and disgrace to the Goddess of Education, Saraswathi, if educated people have bad qualities. Sathyamu sahanamu sahanubhoothi, nirahankaramulo,leni MA la MSc PhD. Right from then, the seeds of the present educare have been sown. Interviewer: You are really very fortunate to have received these letters and Swami has shared His vision with you. Prof. Hemalatha: It is my fortune. Swami goes on saying, especially about education for women and how they should conduct themselves. Interviewer: Please tell us all about it Madam. Explaining why He established this college. He says, I established this college with a great hope and vision. “Here people should abandon all bad qualities like jealousy, hatred, ego, exhibitionism, etc. They should work with mutual co-operation”. This is the high expectation of Swami, to expect this college to be ideal in all fields. This is how He started this college and being the instruments in His great mission, is itself a great fortune and at the same time, a great responsibility. Truly, it is very, very difficult and one should dedicate their lives to fulfill this! very good name in the University. It was given a special status of being the Lead College; they used to call it the Lead College from the year 1977. I took charge as principal in 1974. In 1969, I was made in-charge for 2-3 months and then because I was not having enough experience to be the Principal, Swami made me the Vice-Principal and then He made me the regular Principal from 1974. Within three years, the college became a Lead College in 1977. The strength also went on increasing from 120 in 1968 to 1250 by 1977-78. Watching this wonderful performance of our college, Andhra Pradesh State Government offered Autonomous Status to the college in the year 1979-80. Bhagavan had His own way of working. He thought of having not merely an autonomous status but to have His own university. This divine will took shape in one year and by a special act of the University Grants Commission, Sri Sathya Sai Institute of Higher Learning (now Sri Sathya Sai University), the Deemed University came into being in November 1981. Interviewer: When He opened the college in 1968, He made a reference in the Divine Discourse that this College will form the seed for a future university. He envisioned it then! Prof. Hemalatha: It gradually grew to become a University. Nobody could believe that an ordinary affiliated college started in such a miniature scale will become and develop into a University. Of course when it was a college itself, the University (Sri Venkateswara University) sanctioned post graduate classes in 1972. Post Graduate program in Telugu Literature, was started first and later, we had courses in Home Science, Philosophy and English Literature, which were added after the Sai University came into existence. Interviewer: Swami envisioned in 1968. Now it has attained a global reputation. Dear Readers, in Part 2 of this special feature, Dr. Hemalatha reads out some of the letters that Bhagavan Baba wrote to her, advising her personally how best to perform her duties and handle challenging situations and people. We are confident you will find the account riveting.